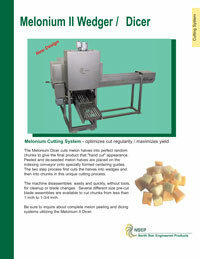 Melonium Cutting System - Optimizes cut regularity / Maximizes yield. The Melonium Dicer cuts melon halves into perfect random chunks to give the final product that "hand cut" appearance . Peeled and de-seeded melon halves are placed on the indexing conveyor onto specially formed centering guides. The two step process first cuts the halves into wedges and then into chunks in this unique cutting process. The machine disassembles easily and quickly, without tools, for cleanup or blade changes . Several different size pre-cut blade assemblies are available to cut chunks from less than 1 inch to 1-3/4 inch. 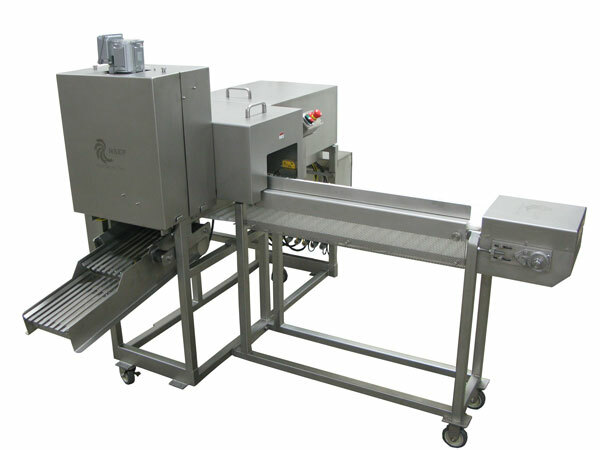 Be sure to inquire about complete melon peeling and dicing systems utilizing the Melonium II Dicer. With 6-blade pre-cutter - 1" x 1" x 3/4"
With 8-blade pre-cutter - 1" x 3/4" to 1" x 5/8"